Capping off a year where it seems like nearly every media outpost (including our own Star Tribune, Pioneer Press and Fox 9 Morning News) was either doing a story on it or proclaiming it the “lifestyle trend” of the moment, HYGGE was officially added to The Denmark Canon’s (danmarkskanon) values list after a nationwide online poll conducted by the Culture Ministry. In December, Time magazine pronounced it “the Nordic trend that could help you survive 2016.” That same month, “hygge” was shortlisted for the Oxford Dictionary Word of the Year. All of this international hubub surrounding hygge didn’t exactly go unnoticed in Denmark. Articles in the Danish press are calling hygge Denmark’s newest successful export and doing their own wordsmithing to explain a concept that has been passed down generation to generation by experience. 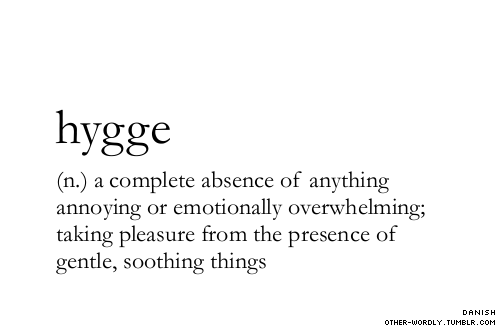 As anyone who’s had a discussion about hygge knows, if you ask 5 Danes what it is, you’ll likely get 10 answers. It’s a concept that’s at once culturally widespread, deeply personal, and lacking a direct translation into any other language. We can’t always explain what it is, we may not be able to help you pronounce it (HOO-GAH? please… no. ), but we certainly know it when it happens. The recurring question we’ve been hearing these days is “Why now?” It’s not like New Nordic Cuisine, where a manifesto and a new crop of stellar restaurants made a sudden splash over a decade ago and then proceeded to take the world by storm. The concept of hygge is not new. So why now? Why indeed. Perhaps it all comes down to how our most basic desires connect with and feed our happiness. For a different visual, take a peek at a painting in the Philadelphia Museum of Art’s collection. It shows an after-dinner gathering of friends (that’s Danish artist P.S. Krøyer in the middle); that’s the epitome of hygge. Just finishing up talking Hygge with Fox 9’s MA Rosko in the Danish American Center’s Kaffestue (1/9/2017). Want to talk about hygge? We’d love to know what you think about the #hyggehubub or what hygge means to you. Weigh in on Facebook, Twitter or in the comments below. And watch this space for a few upcoming #hyggehistorier – short stories on our own hyggelig encounters. A NOTE about those Amazon links: All books with Amazon links listed above are directed to the smile.amazon.com store. Did you know that the AmazonSmile Foundation donates 0.5% of the purchase price on eligible AmazonSmile purchases to a charity of your choosing at no cost to you? Same products, same prices as amazon.com. All you have to do to participate is use the website smile.amazon.com when making your purchases. The first time you go there, you will be prompted to select an eligible 501(c)(3) public charitable organization. We’d be ever so grateful if you chose “Danebo Inc” as your charitable organization of choice. Tak!